Many newborn babies become jaundiced—getting a yellow discoloration to their skin and eyes from high levels of bilirubin (hyperbilirubinemia). Often normal, most newborns with physiological jaundice will have jaundice levels that return to normal without any treatment. They usually have too much bilirubin because their immature liver can't clear it quickly enough, leading to rising levels on days two and three and a peak by day four of five after they are born. Unfortunately, because jaundice can sometimes reach dangerously high levels, sometimes leading to kernicterus and possible brain damage, it is important that jaundice is not ignored. Babies develop jaundice, a yellowish discoloration of their skin and the white parts of their eyes, as bilirubin builds up in their blood and skin. A family history of severe jaundice should also be a warning sign that a baby could develop high jaundice levels too. To determine a baby's jaundice level, a total serum bilirubin (TSB), a blood test, or a transcutaneous bilirubin (TcB) level can be done. Simply looking at a baby to estimate their jaundice level isn't recommended because it is too inaccurate. A transcutaneous bilirubin level is a nice alternative to a blood test when it can be done, as it simply involves determining the bilirubin level in a baby's skin using a device like the BiliCheck machine. Bilirubin levels can then be plotted on an hour-specific nomogram to help determine if a child needs treatment, which usually includes conventional phototherapy, also referred to as a light treatment. Phototherapy uses a narrow spectrum of blue light to help a baby convert bilirubin into byproducts that can be excreted in urine and bile. In addition to traditional double bank phototherapy that is often done in the hospital, jaundiced babies are also sometimes treated with biliblankets (a fiberoptic pad) or on a Bilibed. Home phototherapy is also sometimes prescribed for those babies who are not at high risk for developing jaundice that could reach dangerously high levels. Another treatment for extreme levels of jaundice is an exchange transfusion, in which a predetermined amount of the baby's blood is removed and replaced with donated blood. Most importantly, all babies should be seen by their pediatrician within a few days of being discharged from the nursery to have their weight, percent change from birth weight, and risk of jaundice checked. This first visit to the pediatrician is important so that excessive weight loss and high levels of jaundice aren't missed. This is especially important for babies with extra risk factors for developing a high level of jaundice, including preterm babies, babies with feeding difficulties, severe bruising or a cephalohematoma, or a blood type difference from their mother (ABO or Rh incompatibilities). Alternative remedies for jaundice should be avoided. A common home remedy for jaundice that should be avoided is putting in your baby in sunlight. 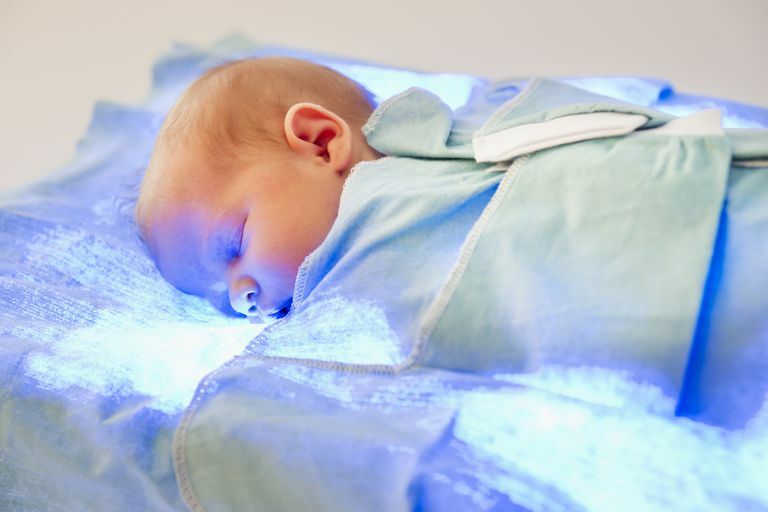 In addition to the blue light that is included in standard phototherapy, sunlight also exposes your baby to ultraviolet light and infrared light. And the short amount of time that your baby would likely tolerate this sun exposure will likely do nothing to his jaundice levels. According to the AAP, "the practical difficulties involved in safely exposing a naked newborn to the sun either inside or outside (and avoiding sunburn) preclude the use of sunlight as a reliable therapeutic tool." breastfeeding jaundice - jaundice that worsens because of poor breastmilk supply or inadequate nursing in a baby's first week, leading to dehydration and excessive weight loss. breastmilk jaundice - unlike breastfeeding jaundice, these babies are nursing well and have mild levels of jaundice that may linger for two or three months. hemolytic disease - conditions that lead to red blood cells breaking down, releasing extra bilirubin, such as blood type incompatibilities, hereditary spherocytosis, and G6PD deficiency, etc. And of course, older infants and children can get jaundice from other causes, including hepatitis, drug reactions, and mono. American Academy of Pediatrics Policy Statement. Management of Hyperbilirubinemia in the Newborn Infant 35 or More Weeks of Gestation. Pediatrics 2004; 114:1 297-316. Burke, Bryan L. Trends in Hospitalizations for Neonatal Jaundice and Kernicterus in the United States, 1988–2005. Pediatrics February 2009; 123:2 524-532. Newman, Thomas B. Evaluation and Treatment of Jaundice in the Term Newborn: A Kinder, Gentler Approach. Pediatrics 1992; 89:5 809-818. How Can You Prevent and Treat a Yeast Diaper Rash? What Can Happen If a Baby's Blood Type Doesn't Match His Mom's?